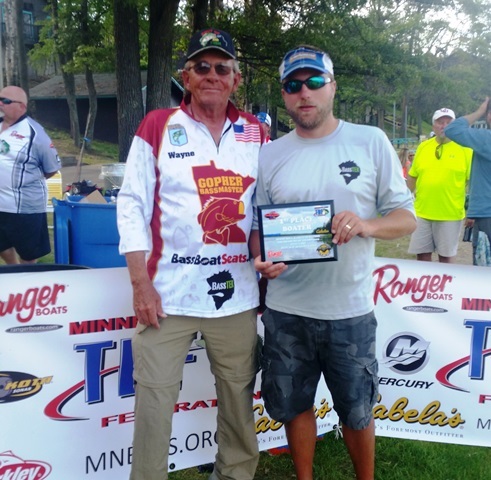 Last Sunday I fished a tournament out of Winona to hoping to qualify for the MN TBF TOC so that I have that option in late September when the time comes. It was an interesting format that it was a team tournament where the captain qualified as a boater and the partner qualified as a non-boater for the TOC. I met my partner Cade early Saturday morning so that we could get a full day of practice and scouting in before Sunday’s tournament. We found quality bass early on the main river and then moved our way back in to the backwaters as the day went on. We found some good quality fish in practice, but there were some really slow periods and tough stretches with out hardly any bites to show for it. By far the highlight of the day was a 4.09lb largie that I plucked from a thick mat punching an Evolve Kompak craw. I am continued to be impressed how my Dobyns DX795 FLIP over powers fish even in the thickest mats. We didn’t linger in this spot much longer, as we knew this would be an area to spend considerable time in during the tournament. We drew out in the middle of the field, but we were able to reach our main river rock and sand spot before any competitors, but unfortunately there was plenty of recreational competition. I manage a small keeper largemouth on a popper and Cade got a close to 3lb smallie on a swim jig. We hit a few more spots and we put a few more keepers in the boat, from there we started to work further back of the main channel. We picked off largemouth on swim jigs, flipping and frogs but not quite the size we knew we needed. With about 3 hours to go, we headed back to the area where the big fish came from in practice. We slowly worked the area, Cade frogged and I flipped, and we managed the key bites to fill out our bag including a close to 4lb fish that I was able to catch flipping the edges. The frog definitely caught the numbers and some good quality, but by splitting duties in a team format, we maximized our area. We ended up with 5 fish for 14.95lbs, which was a solid 3rd place finish which qualified us and got us in the money, not a bad weekend on the river. Much better then my last trip to Winona! My next tourney will either be the Prairie BFL or the BASS Nation TOC. Stay tuned, still plenty of fishing left this year! This past Saturday to Saturday was nothing but bass fishing and more bass fishing mixed with a little tackle prep and driving. Four 12 hour practice days and four 8-9 hour tournament days. It started at 4:30am on Saturday September 1st with a 2.5 hour drive to La Crosse, WI to begin my practice period for the TBF Nothern Divisional on the Mississippi River. I spent all four of my practice days in Pool 8 of the Mississippi River, being this was a draw format tournament, I did not want to have time wasted locking and running during my potential four hours. For the most part my practice was pretty productive, each day eliminated a ton of water and found a few areas or stretches that I felt pretty good about. I definitely spent quite a bit of time in the huge lake area around and north of Stoddard looking for the mother load of grass fish, but they eluded me. Day 1 of the tournament, I drew Brian Dull from Ohio and he had some fish in the Black that he wanted to spend time on, so I decided to stick close and fish my fish on the upper end of the pool. I ran to a rock bar in the Black where I had two 3lb smallies in practice, it only yielded one short. Next stop was a sand/rock drop that I fished with a Ima Square Bill, I caught several shorts and one keeper. That burnt up about an hour and they we headed to top of French Lake. I worked it hard with a jerkbait only to catch several shorts, the same jerkbait that put an easy 13lb limit in the boat 2 days prior. I then hit one of the better sand points with my Square Bill and picked up a nice 3lb smallmouth. I then worked that point a Game Hawg on a Carolina rig and got another keeper on the first cast. I caught many more shorts on the C-rig in the area and on other points. After hitting other points and getting shorts, i came back to first point and caught my 4th keeper on a Lethal Weapon Drag Queen Football jig. We worked the area a bit more, but then started heading back to the Black River. On the way out, I made a quick stop on a small rock point that eyed up on the way there. One cast with a Baby Brush Hog and keeper #5 was in the boat. 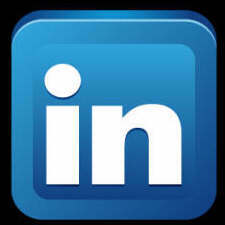 We ran a few areas of my partners in the Black, many short and a few missed opportunities for him. After that we returned to an area that I had. I caught a nice fish flipping a beaver house to get rid of a small 14 incher. We then pulled up where i caught my first keeper, I noticed a bit of bait, so I cranked my Hydrowave on full Shad Frenzy, the bass started pushing bait, I caught a keeper I could not use on the Ima Square Bill and my partner got his 4th fish, we made it to check-in with 20 seconds to spare. I weighed 11-05, middle of the pack and 4th on the Minnesota team. Day 2, my partner Joe Mazzuca had only 1 fish on first day, so he let me pretty much run the show. We hit a few closing and wing dams at top of the pool, couple shorts, Joe lost a smallie at the boat and a big drum for me. We hit two more wing dams on the way down to Stoddard area. My closing dam fish did not cooperate, Joe got a swim jig fish and I caught a nice 3.5lb largie on a Ribbit and missed a few other nice fish on frogs/toads. From there I went to a flipping area where I got another keeper on a Beaver. I decided I needed show these fish a little more finesse, so I went back through the prime area with a Leech Fleck Kompak Craw and boated a 4-04 Largemouth. I was starting to get against the clock, so I ran to some cut banks further up the pool. I caught a few shorts and a 15″ smallmouth on the Kompak craw. We then headed for the Black, we only had about 20 minutes to fish, neither of us could fill our limit. Disappointed with my 4 fish effort, but they weighed well at 11-07, that 5th fish would have been huge. Thank goodness for the big fish that the Kompak craw produced. I slipped to 5th on my team, but move up a little in the standings. Day 3, I knew I needed a bigger bag, so I ran straight down to my flipping area that yielded the 4lb bite the day before. It was a little slow, I once again got a small keeper starting around with the Beaver, but then switched to the Kompak craw and caught 3 more keepers including a 3lb fish. From there, I hit up the closing dam area, finished up my limit, but could not get the frog fish to bite. I hit another flipping hole near the box and got a decent cull on the Kompak craw. With about 2 hours to go, I hit some of my good wing dams from practice, could not get any good smallies, but plenty of big drum on a football jig. We finished up in French, but the fish would not go in the short window we had. I ended up with 10-15 on the final day. It was good weight for our team to stay in 4th place and get a decent check. I ended up 25th overall, but learned plenty about the late summer to early fall transition on the Mississippi River. Right after the weigh-in and team picture, I had to head from La Crosse to Walker, MN to fish a NABC tournament on Leech Lake. The drive was a bit over 6 hours and Leech is massive at 120,000 acres. I had not been here in about 5 years, but it for the most part is a shallow fishery, fish what you can see is normally the deal. We were greeted with moderate winds in the morning that grew to 25mph that caused 7 foot waves on the main lake and washed out other shallow fish. I fished this event by myself, as my partner Josh was down at Fort Gibson Central Open. We needed to fish them all to make championship. 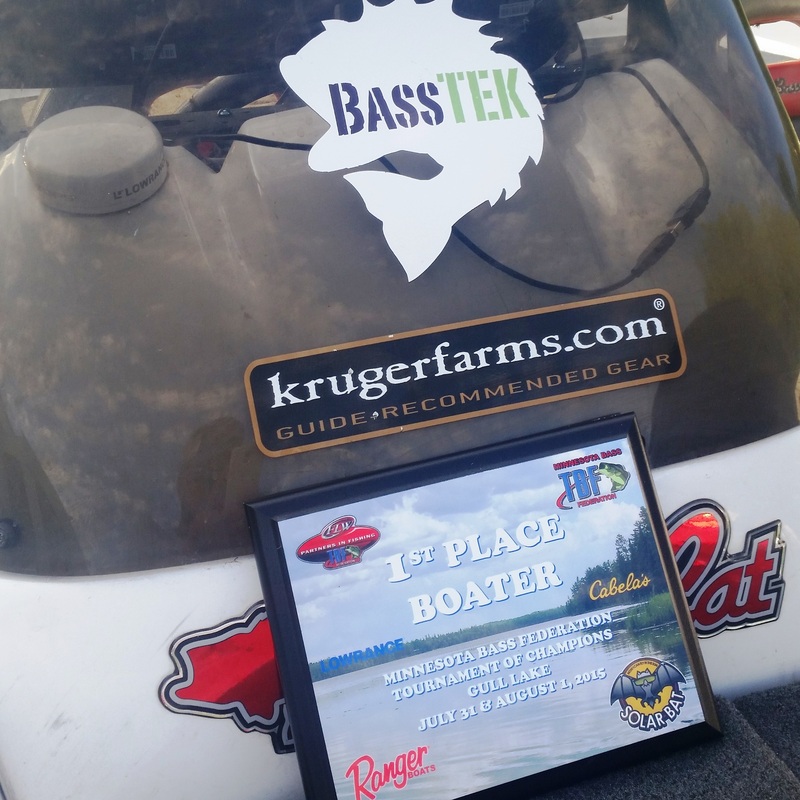 With no practice under tough conditions, I only managed two decent fish for 5lbs, but we made the Championship and the Basscat held up well in the big water. I will be on break for a couple weekend before I start practicing hard for the NABC Championship out of Red Wing. I was really looking forward to this year’s MN BASS Federation Nation tourney for a couple reasons. One, I am always looking to do well in this tourney and move on to the Northern Divisionals. Also, after the last 2 years where I had a monumental day 2 collapse on Pokegama and then Tweet Gate on Tonka last year, I had a major chip on my shoulder coming into this event. I got a little bit of a late start on Saturday, the first official practice day, but I fished until nearly dark that night. I was on the water by 7am launch time every morning and fished until 6-7pm every day of practice. Determined to find enough quality fish for this tournament. Kudos to my club member Dave Cindrich for borrowing me his boat, otherwise it would have been tough for me to get these long hours in for this tournament. Practice was not easy, although I found tons of fish, I only had a handful of areas where I felt I could get consistent 2lb plus fish that a guy needs to make a Top 12 at the TOC. I was pretty confident that 11-12lbs day would be all an angler needed to make a Top 12 and move on. I had boat 75 of out of 80 on day 1, which did not bother me too much, but I was a little stunned when boat 74 went to the inside turn I wanted to start on. Not phased too much, I went to my second choice about a 1/4 mile away. 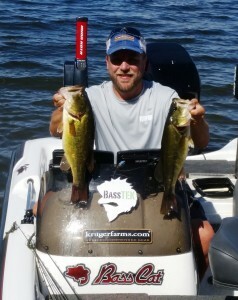 I quickly put a solid keeper in the boat on a DT6 crankbait, while my partner caught 2 nice fish on a jig. Constantly seeing fish on top of the flat, and they would not take my topwater offerings. On a hunch I fired a custom painted square bill that I had tied on the night before. I think i caught a keeper on my first cast, pretty cool feeling. We hopped around to a few of my spots for the next couple hours, I eventually ground out a limit by 1pm after losing a couple keepers, but my 5th fish was bigger then the 2 that jumped off. We hit some of my partner’s water in Trout, I did drop a nice 2lb fish on a drop shot from behind him and he got his 3rd fish. I then hit a spot in Trout and made a decent little cull. We ended the day in Cross Lake where i caught 3 keepers on a deep weedline on a jig, but no upgrade. I ended up with a disappointing 9.30lbs mired in 58th place needing a 13lb bag on day 2 to move up to the 12 cut. I fished with former club member Mark Elert on day 2, I had about 1lb more then him on day 1 so we took my boat. Again I got an early keeper on the DT6, then put 2 nice fish in the boat on the square bill including a nice 3lb fish. I finished my limit on a jig and Mark caught 2 on a jig on this first spot. Mark and I traded spots the rest of the day, both catching nice 2lb fish. In the end, a better day, but not good enough. I caught 10.9lbs, for a 2 day total of 20.20lbs and a 29th place out of 160 finish. Respectable, but anything outside of the Top 12 is a huge disappointment. I lost a couple fish, that may have got me closer, but I really don’t think I ever got the bites I needed. My 2.25lbs practice fish became 1.75lbs fish and I never found a place for kicker fish to make up for that drop off in practice. I am hoping to fish the TBF MFBA State tournament at the end of September out of Wabasha, hopefully redemption can be found there. Wow, what an event! The weights did end up being huge like I expected, maybe even bigger then I expected, but not who I saw winning before it all started. Cut right to the chase, Kevin VanDam dominated this event and rewrote a bunch of the record books this weekend. record of 56-02 set by Luke Clausen at Toho in 2006. # Equalled Rick Clunn for most Classic victories (4) & Joined Clunn, who was previously the only angler to win back-to-back Classics. # Won his 3rd Classic in 6 years. # Won 5 of the 6 most recent major B.A.S.S. titles – Angler of the Year (AOY) in 2008, 2009 and 2010, and the Classic in 2010 and 2011. # Surpassed Roland Martin’s record of 9 major B.A.S.S. titles. Roland won 9 AOY titles. VanDam has now won 6 AOY titles and 4 Classics. (Martin still holds the record for most AOY titles). # Became the only angler ever to win 2 Classics on the same venue. # Set a new 3-day (5 bass limit) Classic weight record of 69-11. # Eclipsed the previously unthinkable mark of $5 million in career earnings. – Day 2, he felt the fish stop eating his spinnerbait they did on day 1 early on, he made a critical bait switch to a crankbait, his signature Strike King 1.5 Square Bill (chart blk back), before others clued in. That is how he got his seperation on day 2. – He also dialed in to the retrieves and what triggered this fish better each day then his competitors, example he used a 5.4:1 signature Quantam reel , which helped him slow down his crankbait better then other anglers that he said were fishing too fast much of the time. – Magic Cookies don’t hurt either!!! I think Brent Chapman had a chance, but I think in the end it was “our” warm water up north that cost him on the final day. He said his Mississippi River fed area dropped water temperature 10 degrees over night. So my guess is that all the melting snow in the Midwest finally reached him and cooled the water down enough to push back his fish enough to take him out of shot, although it’s doubtful that Venice area even when perfect could produce 25lb plus bags like Lake Cataouatche did. BassPro & his new Strike King 1.5 Square Bill in Chart/Blk), better get them fast, because they will sell fast!!! 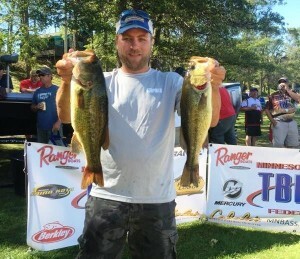 Hats off to Derek Remitz, fished a great tourney, just could not get big bites on day 1 ended in 3rd and also Federation Nation Champion Brandon Palaniuk who ended up 4th, not sure why I took him off my Fantasy Team at the last minute I look forward to watching Brandon on the Elite Series this year. Interesting day on the Louisiana Delta today, fog got things off to a slow start, not a huge factor with only a 70 minute delay, but still a factor none the less. I really thought there would be more big weights today, it was good but not great. I am kind of surprised the Aaron Martens is leading this event, didn’t really seem like his type of event. I know KVD is a threat every where, but I thought he would fair more like he did on Red River in this event. So my fantasy team is mired in mediocrity at the moment, hopefully some of my guys bust some 20lb stingers tomorrow. Hackney is just about toast in the Classic, although local fav Cliff Pace is still alive but needs to make a move tomorrow. Interesting that the top 3 anglers are all in an area called “The Tank Pond” which is only about 15 minutes from take off. It seems the quality of the fish in the Tank Pond Area is beating out the sheer numbers of Venice and other areas. Only problem is Marten, KVD & Rook are sharing the same flat with each other and Remitz. They all did some damage today, only time will tell if it will hold up, deplete or get even stronger as the week progresses. Also, sounds like Bobby Lane & Chapman crushed the fish for the short time they got to fish down around Venice, so they have a shot, as do probably the top half of the field if they can bust some 20lb bags tomorrow. I think there will be a lot of movement and shake-ups on day 2. Also, props to Fed Nation angler Dale Hightower who is in 6th. Should be a super exciting Classic! I got tons of good nuggets that I keep tabs on and post through-out the day on my Facebook Fan Page – check it out and stay tuned tomorrow! Also, got my own BMC Ebay Sale this weekend! 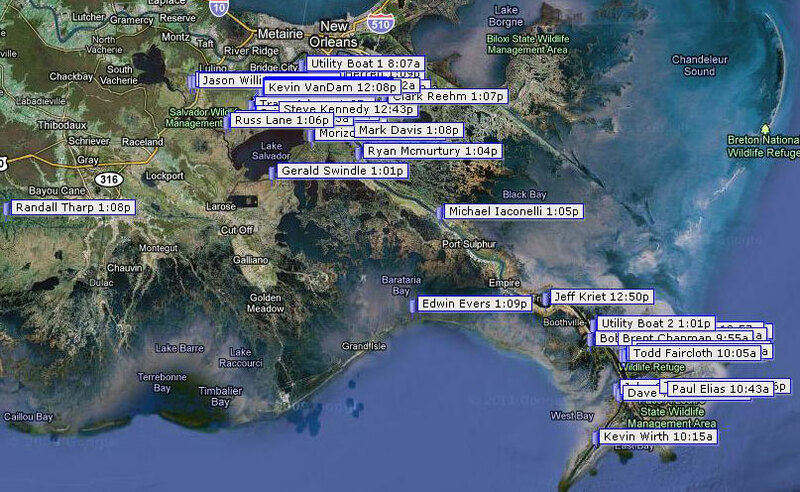 Here is a sweet map, screen shot from Live Classic Blog & BassTrakk today! 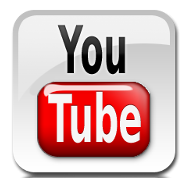 Prepping for the Bassmaster Classic, there are kinds of great article, videos and more on the web right now. So I am going to share a few of the highlights. If you are playing the new BASS Fantasy Fishing Game, with the new 5 tier angler system, you are going to need some dark horse picks to fill these buckets. Couple ideas for ya…. Look no farther then the 2010 Bassmaster Weekend Series champion, read how Ryan McMurtury recently won the Bassmaster Weekend Series South Carolina opener, held Jan. 29, 2011, on Lake Murray. He is obviously fishing well and with a lot of confidence right now and that should never be overlooked. Not to be outdone, Federation Nation champ Brandon Palaniuk has spending a lot of time pre-practicing for the Classic. Check out his video interview posted on Bass Parade . After all, he won his Championship up state for on the Red River. Could we revisit the magic of the great Bryan Kerchal? 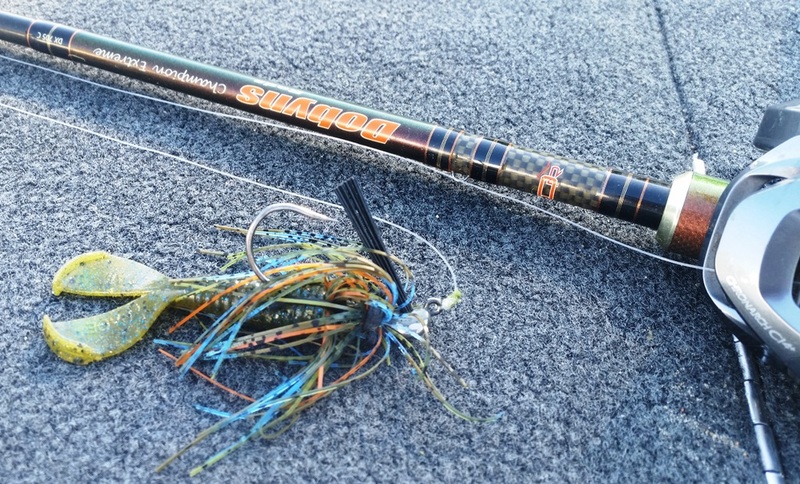 Lastly, check out this super sweet breakdown by Greg Hackney on the Louisiana Delta Classic! Sure sounds like it will be a Classic for the ages! Anybody else got some good tidbits to share? BASS announced Monday a new qualifying structure for the 2012 BassmasterClassic and Bassmaster Elite Series, expanding the Classic field toinclude an enhanced cross section of anglers and putting an increasedemphasis on performance in single events. My comments and thoughts highlighted in red below where I have a take. While the overall number of Classic spots (36) awarded through the EliteSeries will remain unchanged, in 2011 each Bassmaster Elite Seriesregular-season event winner will receive an automatic berth into the2012 Classic. The Toyota Tundra Bassmaster Angler of the Year standingswill still determine the majority of the Classic qualifiers as the top28 in those rankings will also advance to the Classic. All the more reason to fish for the Win, guys like Kevin Short wished this rule would’ve been in effect for this year. I like this twist! Following the Elite format, each of the nine Open event winners willreceive automatic spots in the 2012 Classic. With each pro-level eventwinner receiving a Classic berth, BASS has upped the cache of the BassPro Shops Bassmaster Opens by allocating nine Classic berths, up fromsix, to the Series. The traditional points system used in the Opens willonly determine future Elite Series qualifiers and will have no bearingon Classic berths. Not sure, if I am all behind this, but could increase participation, since you are never out of it and could increase jack-potting by locals at events. I kind of like rewarding the best over 3 total events, but I can live with it. The Classic field will increase to 54 – assuming all competitors are ingood standing – clearing the way for a guaranteed entry for the 2011College Bass Champion. The entire qualifying structure, for both theElites and the Classic, can be found below. I think a few more anglers is good, as long as they don’t get too much larger, if its 75 anglers in a few year, loses prestige. Providing a dedicated avenue for the College Bass Champion, again to beheld in Little Rock, AR, in 2011 and aired on ESPNU, will enhance theprofile of college bass fishing and represent an added, youth componentto the Classic. There are currently 220 colleges registered to competeto qualify for the 2011 College Championship. The qualification processfor college anglers can be found at www.collegebass.com. Good for the sport, although, not sure how “qualified” these anglers are, guess we will see how they fair in Classic. Wonder if any pros, will return to school to fish???? The defending Classic champion will automatically qualify as in yearspast. Additionally, six Federation Nation anglers will continue toqualify as well as the Toyota Tundra Bassmaster Weekend Series Championoperated by American Bass Anglers. In the case of double-qualifiers,BASS will work down the Elite Series AOY list. The 2011 Classic and Elite Series qualifying implications will remain aspreviously released. In 2012, the Elite Series field will encompass 90competitors. BASS has a renewed emphasis on restricting the Elites tosmaller fields, putting more focus on individual anglers and creatingincreased brand-building opportunities for the best anglers in theworld. As such, the 2011 Toyota Tundra Bassmaster Angler of the Year standingswill advance 73 anglers into the 2012 Elite Series. The top five inpoints standings in each of the three Open Series will also receive 2012Elite qualifying berths and if any of those competitors decline, BASSwill work down the Open standings to fill the five berths.Additionally, the 2012 Bassmaster Classic champion and the 2011Federation Nation Champion can elect to fish the Elites. Alldouble-qualifiers will work down the Elite Series AOY standings. As BASS previously laid out, only active Elite anglers have threeexemptions – former Bassmaster Classic champions, former Toyota TundraBassmaster Angler of the Year winners and anglers with 10 or moreClassic experiences – that can be applied if an angler fails to qualifythrough the outlined avenues. With the revamp of the qualifying structure, the 2011 Bass Pro ShopsBassmaster Open payout has also been revised. In addition to theClassic qualifying berth, the winner of each event will receive $10,000and a $45,000 boat package. The total prize package – including theClassic berth – reflects the prestige of scoring an Open victory. I have heard some griping here, some guys want an all cash prize, but if sponsors are contributing boats, that is great for sport, also the winners will get an automatic $10k just for showing up to Bassmaster Classic, plus with that automatic berth and publicity, they should be able to convert that to additional cash. Each event will pay through 40th place with a more even distributiontowards the lower rung. Additionally, with the allure of increasedClassic berths, the potential of sustained full fields throughout eachdivision increases. This is good, and I think is direct correlation to boat for winner, better for more guys to make money at sport. 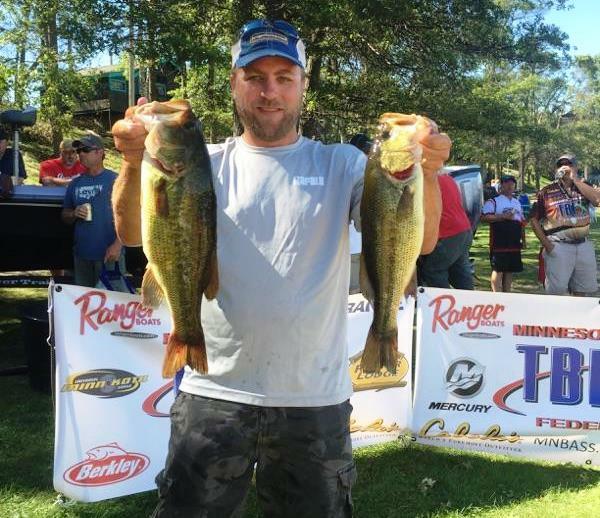 Entry fees will be slightly upped – $1,250 per event on theprofessional side and $350 per event on the co-angler side — but BASShas raised the stakes for Open anglers. The Opens will only feature the top-12 pros and co-anglers on the finalday of competition, which at each event will be held at a convenientlylocated Bass Pro Shops. * Exemptions include former Bassmaster Classic champions, AOY titleholders and anglers with 10 or more Classic appearances as of March 1,2011. Must be an Elite angler in good standing to use.